In the past, skin care has always been a concern for many people, especially women. 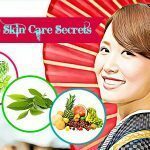 There are many ways to nourish the skin as well as treat skin problems such as dry skin, acne or freckles. Almost all of these ways are shared by people without scientific evidence. Therefore, there is a lot of misinformation. There are many things that are always thought to be good for facial skin, but the real consequences you get from it are more than the positive results you get. 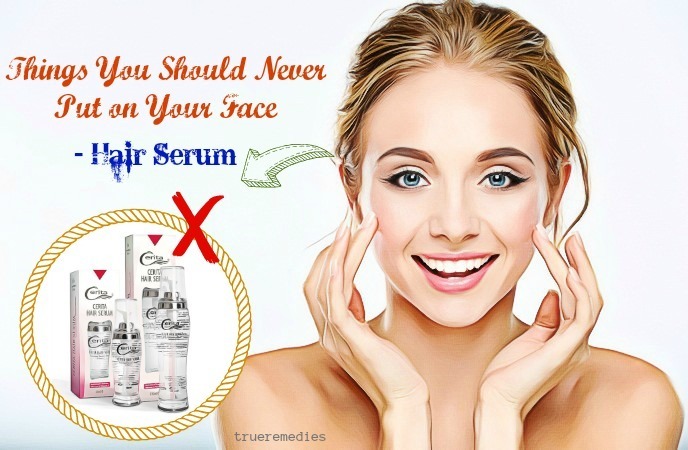 A lot of people do not know that, so we pen this article to provide you with useful information about the ordinary and common things you should never put on your face. But first of all, let’s learn about the common skin types as well as the problems that skin can encounter. They are very helpful to you. If you own normal skin, you are a very lucky person. This is a very ideal skin type. 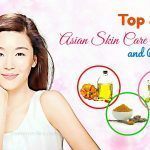 The skin does not dry and secretes too much oil as well. Skin is usually smooth with small pores and good elasticity. Normal skin is rarely encountered with problems like acne and wrinkles. Dry skin is a type of skin which is frequently dehydrated. If you have dry skin, you may feel irritated when washing your face. Dry skin is prone to cracking and peeling without proper care. This is because the sebaceous glands work ineffectively, causing the skin to lose moisture. Therefore, dry skin premature faces wrinkles and skin aging without proper care. However, the advantage of this type of skin is that it rarely has acne and it has small pores. With this type of skin, due to sebaceous glands in the skin is too active, the skin always produces a lot of oil, especially the skin on the forehead, nose and chin. If you have oily skin, you will rarely face the symptoms of premature aging. But its downside is that it is very easy to have acne and large pores. You may want to read: 16 Tips On Best Makeup For Oily Skin Prone To Acne With Large Pores. This is a special skin type. The skin on the face will have different characteristics. Skin is often oily on the forehead, nose and chin, but it usually dry on the cheeks. Therefore, you need more time and effort to care for this skin type. Sensitive skin is thin and prone to acne, irritation, itching or rash when exposed to cosmetics, environmental pollution. Some people even feel irritable when using natural masks. Finding the right care for this type of skin makes many people feel a “headache”. What Problems Can The Skin Experience? Melasma is a very common skin condition. This is the condition in which the face has many brown spots. They usually appear as small patches on the cheeks, nose and chin. Postpartum women, women ages 30 and older, and women who are usually exposed to sunlight are at high risk for this skin problem. Melasma treatment takes a lot of time and perseverance. Freckles are often very easily confused with skin pigmentation. Freckles are also brown spots on the surface of the skin, but they are separate from each other. 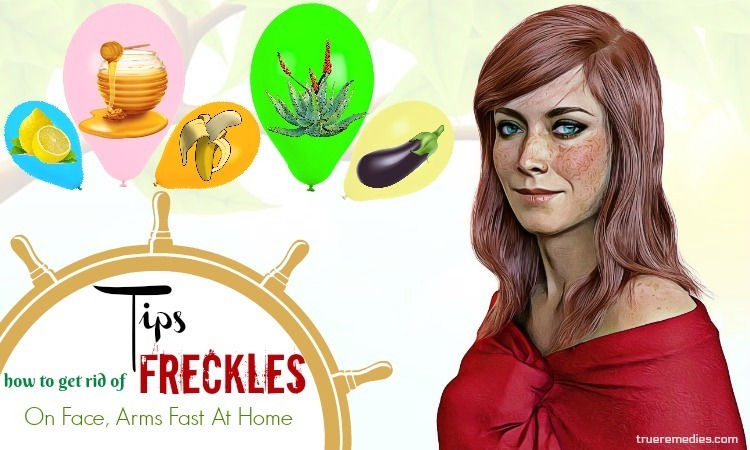 Freckles come in a variety of colors – red, yellow, dark brown, light brown, brown, or black – but they are always darker than the surrounding skin due to pigmentation called melanin. Genetic factors, hormonal disturbances and sun exposure are the main causes of this skin condition. When you are 20 years old, your skin will show signs of aging. Then, especially when you are 30-40 years old, signs of skin aging often show up very clearly. Some of the most prominent signs of aging are dry skin, peeling, wrinkles, poor elasticity, and dull skin. Depending on the type of your skin and the way you care for your skin, the signs of aging on the skin will vary. If you know how to take effective skin care from the inside, you can completely prevent and slow down the aging process of the skin. Aging, pressure, diet, cosmetics and environmental factors such as sunlight, dust and smoke can make the skin quickly aging. Acne is one of the conditions that the skin often encounters, especially in people with oily skin. 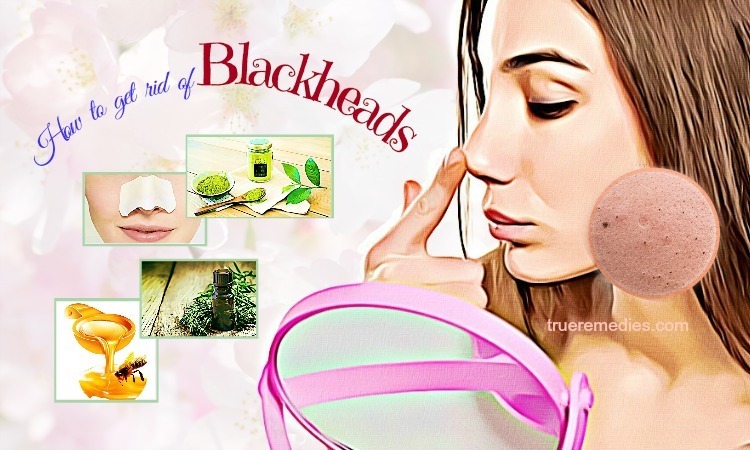 In addition to acne, you may also experience some conditions such as blackheads and whiteheads. Each type has its own treatment. Acne can cause scarring after being treated. The main cause of acne is hormonal disorders and improper skin cleansing. The above are useful information about the skin. Hope they are useful to you. Now is the time to talk about the main topic of this article: Things You Should Never Put On Your Face. 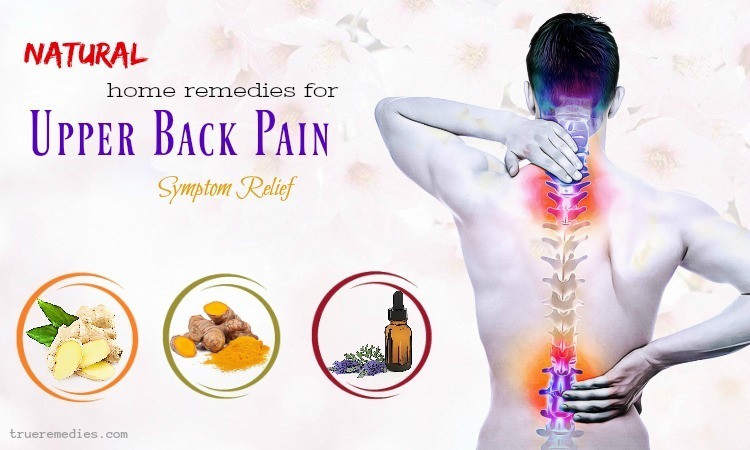 Take a look at TrueRemedies.com ! This is the first one in this list of common things you should never put on your face. Hair spray does not seem so strange to many people, especially those who often want to create new hairstyle. The thing that you should keep in mind upon using this product is that it should never be exposed to facial skin. In the 1960s, modern hair spray gels were invented in the United States by inventor Luis Montoya under the name Dep. Many hair spray brands in North America and the United Kingdom are classified based on numbering. Higher index gels maintain longer hair styling, while lower indexes do not make hard hair and some products give wet hair. Cationic polymers are among the major functional components of the hairspray gel. Active properties in the polymers make them stretch, making the gel more viscous. Hair spray works against natural protein structures. So you can create your own style. In addition, lacquer and alcohol are also components of the hair spray gel. Certainly with the information above, we can convince you not to let the hair spray gel contact with your face. Under the effect of hair spray gel, your skin will become dehydrated, dry and pale. Hair spray also causes acne breakouts. 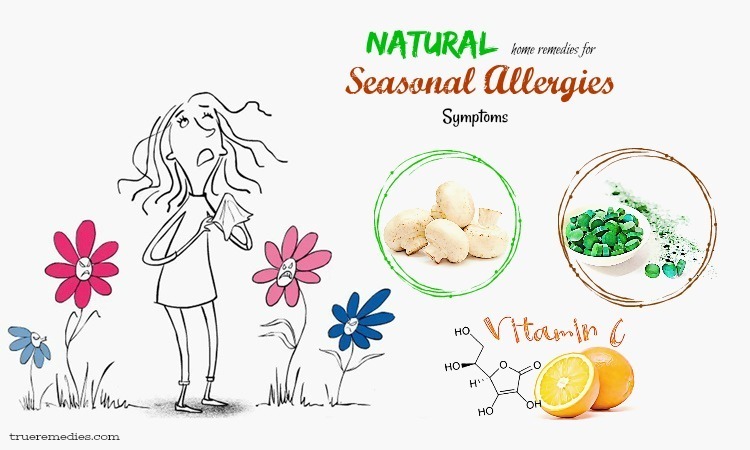 Not only that, it can also make you allergic. As a result, the skin aging process will come sooner and be faster. Does this mean you cannot continue using the hair spray gel? You will not be able to make more hairstyles? 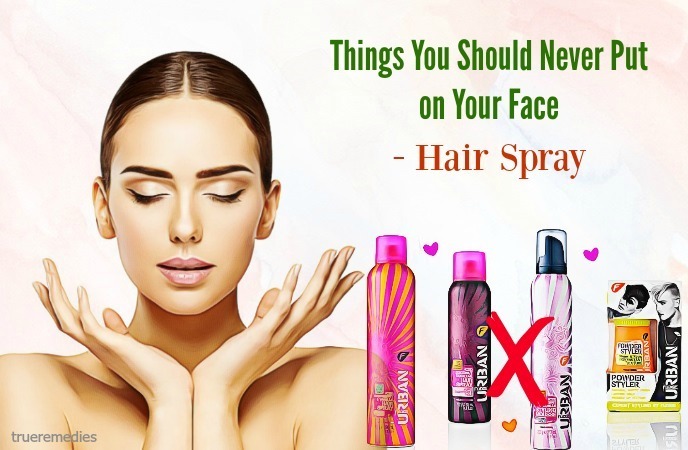 No, even though the hair spray gel is not good for your face, you do not need to remove it from your life. There are many ways to use it without affecting the face. One of the easiest ways to do this is before using a hair spray gel, use a cloth or a sheet of paper to separate your face from your hair. Thanks to that, you will no longer have to worry about the effect of the hair spray gel on your face. Deodorant is the next one among ordinary things should never put on your face. Recently, many women have shared that application of deodorant to facial skin will leave the makeup layer on the face longer. Deodorant is often used to dry and remove unpleasant odors for the skin in your armpits. However, facial skin is a very sensitive area. Therefore, the deodorant solution can clog the pores, causing acne. This is also an explanation of the reason why deodorant makes your makeup layer beautiful. Facial skin is secreted through the pores. Oil makes your make-up gradually removed. Deodorant can clog the pores, leaving the oil unable to escape. As a result, acne will gradually develop. Consequently, deodorant rolls are always a candidate in the list of things that you should never have exposed to your face. When dying your hair, especially when you dye your hair at home, hair dye can stick to your face. In addition, many people tend to dye their brows whenever they dye their hair. This will cause the color of the hair and the color of their brows to be the same. However, this causes the facial skin, especially the skin around the eyes, to be negatively affected. You may notice that you have teary eyes whenever you try to use hair dyes for eyebrows. This is a sign that the eye is affected. Do not let the dye stick to your face. If you dye your hair at home, be careful. It is better to go to a reputable hairdresser to do this. If you want your eyebrows to look like the color of your hair, use a suitable eyebrow liner. In regard to ordinary and common things you should never put on your face, shampoo should not be skipped. Shampoo is a cleanser that removes excess oil and dirt from your hair. However, it is not for this reason that you can use them to cleanse your face. It may be that you do not intend to use shampoo for face, but during bath and shampoo, it is very difficult to avoid this. Shampoos are made for hair care and are not designed to deal with delicate molecules from facial skin. Therefore, if the shampoo is in contact with the face, it will cause the skin to dry, cracked and pale. It is best to bathe before shampooing, do not do these two things at the same time. Or you can go to hairdressers and use their shampoo service. 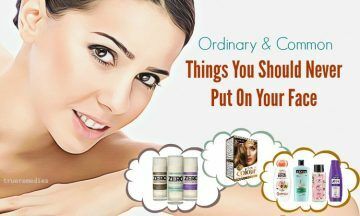 It is no doubt that hair serum is worth mentioning in this series of things you should never put on your face. Hair serum contains ingredients that you cannot use in the treatment of wrinkles or facial problems. They are only good for hair. As a result, do not use them for facial skin. In addition, many hair serums also contain perfume – the number one enemy that irritates the skin. When using them for your hair, you should also be careful to keep them from sticking to your face. The next one in this list of things you should never put on your face is body lotion. Body lotion only works when you use it as a regular body cream. Body lotions usually contain perfumes, which may irritate the facial skin. Body lotions also have a rather thick texture while your face needs something softer. For that reason, if you use face lotion, you can clog the pores, causing acne. Remember that facial skin is a very sensitive area. It’s not like the body skin. In some careless situations, you can make nail polish stick on your face. Unfortunately, nail polish is not good for the face, so you need to remove it from your face immediately. Many people use nail polish to paint on their faces to create interesting drawings before joining a music show or a street festival. Yet, nail polish should only be used for nails because they have acrylic molecules that make your skin dry and dehydrated. When you polish your nails, wait until the nail polish on your nails dry before doing anything. Nowadays, there are solutions to make nail polish faster, you can try using them. Besides, you can also go to nail salon to use their services. 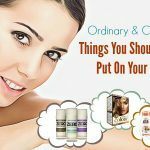 This sounds strange when vinegar comes to this list of ordinary things you should never put on your face, but it’s true. You still hear people say that vinegar can be used as a toner for the face. However, you do not believe in that. Some types of toner contain vinegar, but it is a type of vinegar that has been processed so it can be used for facial skin. Besides, you can also use diluted apple cider vinegar as a toner. Nonetheless, the dilution rate is quite complex and you need to follow the correct formula. Anyway, this is completely different from applying the vinegar directly to your face. This will cause the skin to become dry, cracked, irritated and red. Mayonnaise is definitely one of things you should never put on your face. Mayonnaise is also used in DIY hair masks with moisturizing properties for hair. However, this does not mean that it can moisturize the skin, especially facial skin. This sauce is too acidic and its texture is too thick, so it will cause the pores to become clogged and the excess oil and dirt are stagnant. If you use it too many times for your skin, it will also cause acne and skin allergies. Although eggs are good for skin and eggs are the main ingredient of mayonnaise, you should not use mayonnaise for your face. Like hydrogen peroxide, alcohol is used by many people to disinfect wounds. 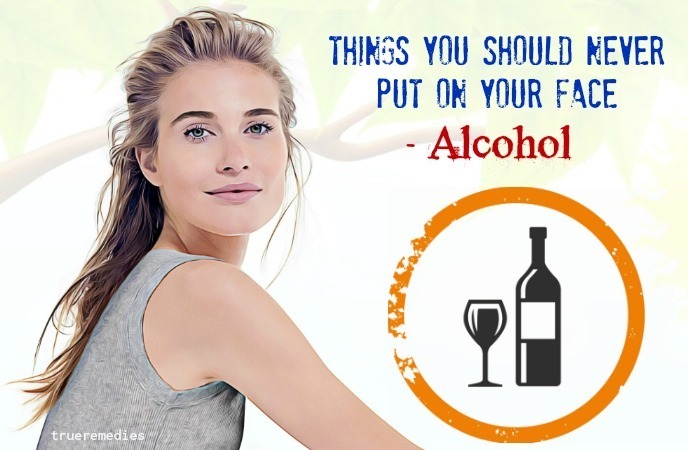 After applying alcohol to your skin, the coolness on your skin can make you feel that this is really effective, but alcohol actually damages the skin, especially with the facial skin. It causes the facial skin to dehydrate rapidly and become dry. It breaks down the DNA of both bacteria and skin cells, causing it to dry out and create dead cells. Before buying a toner, make sure it does not contain isoprobyl alcohol (IPA) – which will erode the skin, clog the pores and affect the skin’s natural production process. Some sunscreen also contains alcohol. If you have dry skin, stay away from them. Do not forget to thoroughly read the ingredients of sunscreen before buying them. No wonder, hot water should be among the common things you should never put on your face. In the winter, many people have a habit of using hot water to bathe, wash their face and wash their hair. This makes them feel better. However, do not rush to do the same thing. Hot water has never been recommended by dermatologists. Although hot water gives a warm sensation to the skin, it can cause skin to quickly dehydrate. High temperatures cause water on the skin surface to evaporate quickly. Hot water also softens the natural oils of the epidermis. Then, the skin will dry. The result of dry skin is aging skin, wrinkles and freckles. These are all very difficult to be treated. If you have oily or acne skin, dry skin will make acne a favorable opportunity to form. So, in the winter, you can use warm water to bathe and wash your face. If possible, use cool water. Remember that cool water is a good friend of skin, especially facial skin. Toothpaste is one of little – known thing in this list of ordinary things you should never put on your face. Many people think that using a toothpaste can treat acne; however, the truth is that toothpaste makes the skin dry and irritated. It can dry up the acne, but it also affects the surrounding skin. Toothpaste can dry the skin, burn the skin and cause scarring. Therefore, do not use toothpaste for facial skin. If your face becomes red and itchy after contact with the toothpaste, apply some tea tree oil or benzoyl peroxide (an antibacterial ingredient used in acne medication) to the skin. 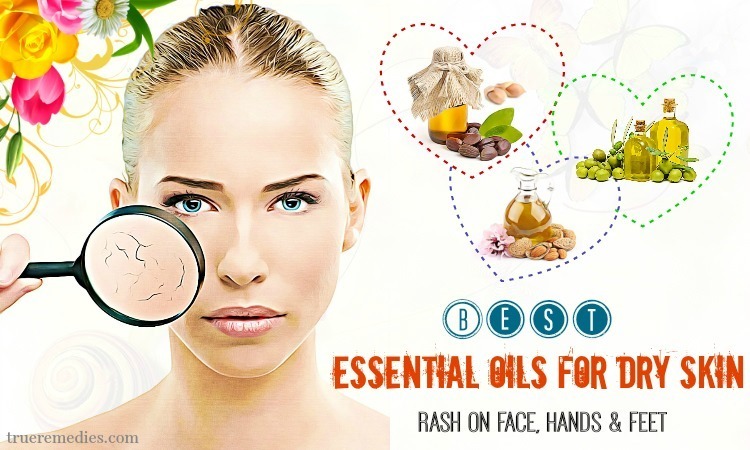 There are many other ways to treat acne such as using tea tree oil or using salty water. Take acne treatments that have proven to be effective and safe. Hydrogen peroxide is regarded as one of things you should never put on your face. Using hydrogen peroxide is the best way to prevent wound infections caused by cuts or burns, but this oxidant is not suitable for acne treatment because it is naturally abrasive, so it can cause burns and blisters. In addition, hydrogen peroxide is a common allergen that can cause inflammation and skin burns. Therefore, you absolutely must not use hydrogen peroxide for facial skin. The next one in this list of things you should never put on your face is petroleum jelly. Petroleum jelly is a main ingredient in moisturizing products that we have been using for a long time. It can be helpful for protecting moisture on the skin which has problems like dryness and fragility. On the other hand, it also supports the treatment of cuts, bites, and other wounds. However, it is not a moisturizer that you can use for a long term. You may find your skin soft and comfortable after applying petroleum jelly to your skin. But in fact, it retains all that your skin has such as moisture, dirt and dead skin cells. It helps to retain the moisture that is present in the skin, but cannot protect the skin under the influence of air. So your skin will quickly dry after you use petroleum jelly. Eating yogurt on a regular basis is good for your skin and health. Many mask formulas for the skin also include yogurt  . Lactic acid in yogurt is able to prevent the invasion of harmful bacteria, giving your skin a good protective layer. In addition, the fermenting bacteria in yogurt can release a natural antibiotic to regenerate the skin, reducing the aging. Nonetheless, you need to be aware that you can only apply sugar-free yogurt to your skin. Yogurt usually contains sugar. As you know, sugar can dry the skin, causing rapid aging skin. Thus, yogurt is not good for skin. Do not apply it to skin, especially facial skin. This is the last one in this list of ordinary things you should never put on your face that we want to mention in this article. Mint is one of the most commonly used ingredients in skin care products . Nevertheless, few people know that mint contains menthol, spearmint, and peppermint. Therefore, it can irritate the skin, especially if you have sensitive skin or acne skin. When used to make cosmetics, mint has been handled to eliminate the above factors. However, if you use mint leaves yourself, you cannot do that. So do not use mint leaves for your face. Above are list of things you should never put on your face. Be careful when using them. If you have any contributing ideas about our article of “Top 16 Ordinary Things You Should Never Put On Your Face” introduced in SkinCare Category, do not hesitate to drop your words below this post. We will answer as soon as we could.